I finished reading Fulgrim, book five in the Horus Heresy series, earlier in the week, and let me tell you, this book was pretty great! It was a little heavy-going in parts, not least because of the subject-matter, but overall, it was a really interesting novel, and one that I think will bear a lot of rambling! The book takes place over a number of years, and unsurprisingly deals with the exploits of the III Legion, the Emperor’s Children, and their primarch, Fulgrim. As with Flight of the Eisenstein before it, we follow the Legion on a sort of generic battlefield at the beginning, as we’re introduced to the key players, before getting into the meat of the story proper. 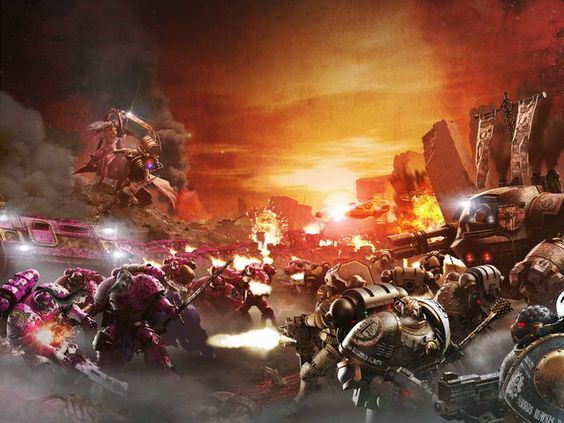 However, unlike the previous book’s use of Jorgall, the fight here between the Emperor’s Children and the Laer will have significant repercussions across pretty much the entire Heresy. Spoilers for the book, incoming! Rather than sticking to the previously-met Saul Tarvitz and Lucius, we’re primarily introduced to Julius Kaesoron, Solomon Demeter and Marius Vairosean, captains of the first, second and third companies, respectively. The way Graham McNeill writes these characters has some pretty exciting twists, as he takes them in directions that I certainly didn’t expect. The story details the Legion’s slide into decadence following the destruction of the Laer, during which Fulgrim finds a sword in a temple, King Arthur-like. The Laer temple is suffused with the sort of degradation that Warhammer fans will instantly recognise as Slaanesh-inspired, but despite this, I found it really interesting to read how the Dark Prince takes a hold of the primarch. It’s certainly a disturbing tale, and the effects of Fulgrim’s slide into depravity have impacts on his captains that I wasn’t quite expecting, as mentioned already. To start with, we have Julius Kaesoron, the terminator-captain of the First. While he’s clearly loyal to Fulgrim, and almost has a father-son relationship with him, he nevertheless comes across almost as something of a Loken-type figure, and I felt sure we’d see him somehow join up with Saul as a Loyalist. However, Julius turns into a depraved maniac who fights merely to experience the rush of adrenaline. Solomon Demeter is notable for his headlong rushes into battle, and feels a kindred spirit with Lucius when the two first meet, but turns out to be the loyalist of the Legion, and his death is perhaps one of the most poignant moments of the entire novel. Marius Vairosean on the other hand, is portrayed something of an unwilling follower, going along with Fulgrim’s wishes out of duty rather than anything else. The effect of his transformation into the first Noise Marine is therefore quite startling, as we see him fully embrace the power of Slaanesh. Along with these three, we also get to catch up with the Chief Apothecary Fabius Bile, as well as Lord Commander Eidolon, and we meet Eidolon’s colleague, Lord Commander Vespasian. Another Loyalist, Vespasian is portrayed as generally a nice guy, which should really mark his card from the get-go, and while his death was unsurprising, I nevertheless found myself wishing we could have seen more of him. Eidolon here comes across more bitter than effectual, and his biography across the five novels of the series so far really begs the question how the hell he made it to Lord Commander. Hm. Of course, it’s not all Emperor’s Children, as we also get to meet the Iron Hands of Ferrus Manus. For all those people who deride Age of Sigmar for having silly names for its armies, I would like to point out that the X Legion are one of the silliest armies I’ve ever come across. Yes, we get the iron theme that’s running through here. It’s like the Bloodsecrator all over again! Ferrus and Fulgrim are portrayed as best of friends, and it’s always something of a problem for me when we see something being set up specifically to depict the sundering of that situation, but the friendship between these two did ring true for me, so that was a good thing. Of course, it’s probably no surprise that Ferrus Manus dies in this novel – making him the first primarch we know to have actually died (the II and XI Legions still have that annoying question-mark over them). I knew this going into the novel, and yet still managed to find myself shaken by the events of the climactic battle. In case there was any doubt, that battle is none other than the fabled Drop-Site Massacre on Isstvan V.
This battle is a horrible mess right from the get-go, as Ferrus Manus receives word of the Emperor’s Children making their base on Isstvan V, and that several of his brother-primarchs will help him to destroy the traitor. 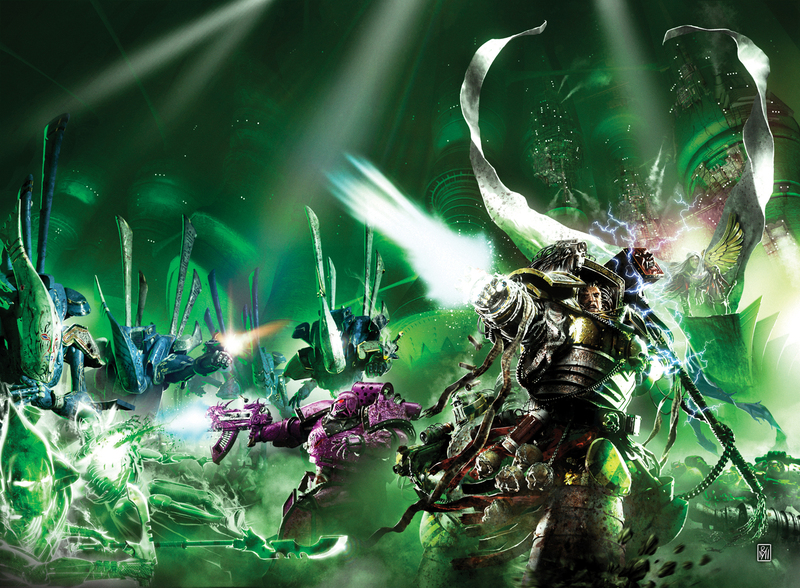 Again, any fan of Warhammer lore will know instantly just how doomed Ferrus is when he hears which Legions will be joining him – Salamanders, Raven Guard, Alpha Legion, Night Lords, Word Bearers and Iron Warriors. It’s clear that he isn’t going to be as reinforced as he thinks he is, and as the reader we’re aware of just how terrible this thing will be. All credit to Graham McNeill for turning out a novel that deals with so much information that we, the reader, are aware of, yet the characters are not. However, as much as I liked this book, I felt it fell short on one notable element – Fulgrim himself. The character arc is something of a hero’s fall, where we see the primarch leading his troops and making perfect plans like a military genius, only to fall to the depravity of Slaanesh, whose dark power forces him to kill his brother Ferrus Manus. Once his brother’s head is rolling at his feet, Fulgrim realises what he has done and is awash with remorse. However, it doesn’t really ring true to me, if I’m honest, as Fulgrim hasn’t really appeared to be all that conflicted – or, more accurately, when he has been shown embracing the new power of Chaos, he is really embracing it. His later remorse sounds, to me, like a child who realises he has done something wrong, but is apologising for it merely because he feels that’s what he must do, and not because of any genuine remorse. Of course, this may be just me! That said, the final fate of Fulgrim is actually quite poignant. Making a dark pact with the demon of Slaanesh in order to stop feeling this supposed remorse, he is effectively imprisoned in his own body as the demon takes over his flesh. The novel ends with the demon pondering how he will change this body in the course of time – alluding to the fact that Fulgrim becomes a Demon Prince, of course. It’ll be interesting to see how this aspect of the primarch is handled in further novels – assuming he plays a part, of course! The Horus Heresy series has, thus far, felt very realistic and gritty, even with such things as the reanimation of the Death Guard and Horus’ spirit-journey, but I’m a little concerned that Fulgrim-as-demon-prince could be seen as perhaps a little too, well, silly. We’ll see!